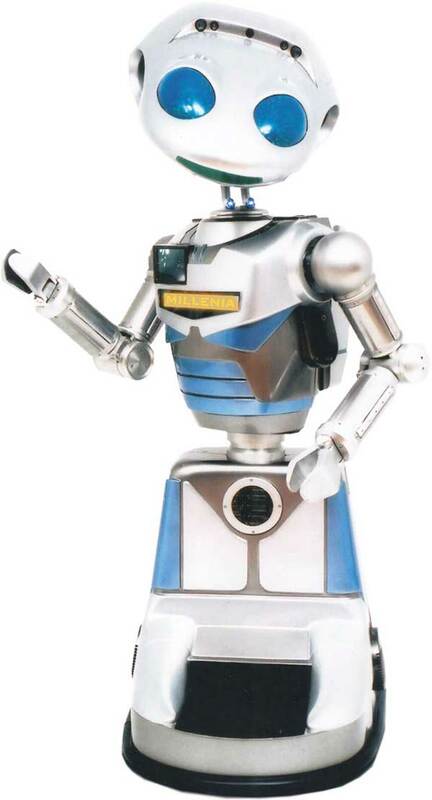 Robot MILLENNIA…when only the best will do. FREE VISIT! Would you like to experience Millennia firsthand at no cost to you? Call us and let us know where you are located, and we’ll contact you when Millennia is near you. You’ll then have the option of scheduling a complimentary demonstration at your offices. The Millennia Robot is capable of many gestures and movements including the ability to carry signs or products. Our exclusive IRI Micro Remote-Control System allows our animators to transparently operate the robot in full view of your audience, from 2 to 200 feet away. The effect is magical and effective. 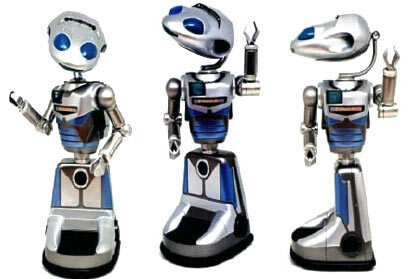 Millennia is the most advanced Social Robot of its kind in the world today, with more expressive body movements and programmable for speeches, dance routines, gestures, messages, etc., with an on-board computer that has a greater capacity for storing and playing back musical segments, sound FX, and messages. The LED panel can be programmed with any message and changed with ease; video screen which can either display a logo or video, or show a live image of the Robot’s point of view so people can see themselves on the screen. Millennia can pay for his own purchases at Hotels, Stores, Restaurants, etc.